By Esther Jackson, Public Services Librarian; Samantha D’Acunto, Reference Librarian; Daniel Atha, Director of Conservation Outreach; and Brian M. Boom, Ph.D., Vice President for Conservation Strategy and Bassett Maguire Curator of Botany. Because of the popularity of the first workshop, the Library offered a second iNaturalist workshop in August. The workshop focused on website and desktop navigation, facilitated again by Daniel Atha. Workshop attendees learned how to navigate the iNaturalist website, including the New York City EcoFlora project, and how to make new observations using their smartphones and tablets. Elementary, middle, and high school teachers were among the workshop’s attendees, which also included NYBG staff, volunteers, and Members. All participants were encouraged to partake in a short “virtual scavenger hunt” to help test out their newly acquired iNaturalist knowledge. Questions included how many plant observations have been made in Bronx County, how many total observations have been made in New York City, and the most-frequently observed animal and plant species in the Bronx. Those who completed the scavenger hunt first were gifted a small Library swag bag filled with iNaturalist and NYBG-related stickers, notebooks, and pens. 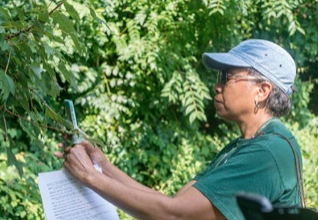 In addition to the New York City EcoFlora workshops, this summer the Library staff collaborated with Kristine Paulus and Becky Thorp of the Plant Records Office to offer a workshop on NYBG’s Garden Navigator. In October Library staff hosted a Women in Science Wikipedia edit-a-thon in collaboration with the Untold Stories project at the American Museum of Natural History.